You can listen to music on your Xbox 360 console by connecting a portable media player, inserting a CD, or playing music from your console’s hard drive. Connect your media player’s sync cable to a USB port on the Xbox 360 console. There are two USB ports on the front of your console behind an oval door. Move to Media, and then select Music Player. Select the music you want to play. Load a music CD into the console disc tray. The music player starts automatically. Select the songs you want to copy to the hard drive, and then select Rip CD. 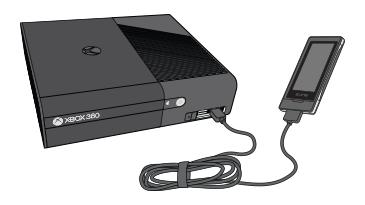 Plug the sync cable of your portable media player into a USB port on the front of your Xbox 360 console. Start a game, and then press the Guide button on your controller. Select the location of the music you want to hear (hard drive or a connected media player). Press the Guide button to return to your game. Your music will play in place of the game soundtrack if the game supports custom music. You can play MP3 files from your iPod on any Xbox 360 console. To listen to music stored in the Advanced Audio Coding (AAC) format, you need to download the free Optional Media Update from Xbox Live (see the steps below). Note The Xbox 360 console can only play AAC files that are not protected by DRM (digital rights management). Protected AAC files will appear grayed out in the Xbox Dashboard. Before you can download non-DRM AAC files, you need to install the Optional Media Update. Go to Bing, and search for "Optional Media Update." Select Optional Media Update again. Select Confirm Download. The download is free. Once your download is complete, select Continue, and then return to the Xbox Dashboard. Important If you are using a friend's console and you have already downloaded the Optional Media Update on your console, you won’t be able to download the Optional Media Update again. The Optional Media Update can only be downloaded by a gamertag once. To listen to your non-DRM AAC files at a friend's house, your friend needs to download the Optional Media Update. Would you like to contact Support regarding the "How to listen to music on your Xbox 360 console" issue you were reading about or a different issue?